I’m still loving the Panasonic TZ5 and as it has a really exposed lens, getting a good camera bag was high on the to-do list. 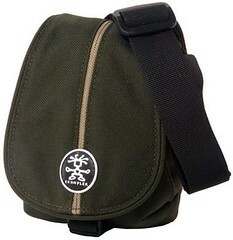 After a bit of research I bought a Crumpler Pretty Boy XXS. The TZ5 fits easily in the main compartment and is well protected. There is space for another battery and also a card holder. What I like is that it isn’t a zip that seals the compartment but a large padded flap that seals with velcro and a clip fastener. The second pocket is also velcro sealed. I’ve used it for the last couple of weeks and it’s certainly stopped the TZ5 from scratches, scuffs and any lens damage. Great bag – crap name! Highly recommended for TZ5 owners.